Natural Import Company - Traditional Japanese foods - Mitoku Butterscotch Candy - 1.76 oz. 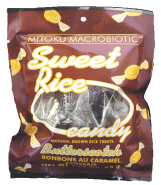 Mitoku Butterscotch Candy - 1.76 oz. Ingredients: traditional rice malt (whole brown rice, sprouted barley, spring water), umeboshi paste. Butterscotch candy is the choice flavor for all of you butterscotch lovers. Only the Japanese could create this taste from using ume.